Making fries with peanut oil has fallen out of fashion; not at Hull's homey little casse-croute. The Place: It’s got a gimmicky name and a cartoon logo but there’s something surprisingly quaint about Mille et Une Frites, the fast-food burger joint on Eddy Street in Hull. The menu is customary for a casse-croute: nothing more than burgers, hot dogs, and fries. But owner Marc Gravelle believes that good food prepared properly, rather than fancy marketing or a mile-long menu, is what matters to his customers. The Deal: To be clear, you won’t find organic beef patties or avocado at his bare-bones burger shack. Yet, Gravelle goes the extra mile to entice hungry workers from nearby office towers away from fast-food chains. The meat is fresh, not frozen, and comes from the butcher shop that’s three blocks away. The mayonnaise and other dipping sauces are made from scratch, fresh eggs and all. Signature dips include roasted garlic, chipotle, and curry, as well as a weekly featured dip, apparently adored by regulars. The Dish: It was fries that drew me to Mille et Une Frites in the first place. For one thing, I’d heard they use peanut oil, an ingredient which has fallen out of favour due to allergies but is widely known to produce the crispiest frites. These were the fries that reportedly placed 6th for all of Quebec in a provincial contest for the best fries. I had also heard rumours that these fries stand straight up and leave no grease stain on the cardboard container. A place that takes its fried food seriously: this I had to see. Talk about disappointment. My fries were tasty, but crisp and grease-less they were not. After lunch I chatted with Gravelle, who had to admit that the batch I sampled was second rate; the result of a busier-than-expected lunch rush. The potatoes hadn’t been able to “rest” for long enough (up to an hour and a half) after being blanched. This is the critical step, explained Gravelle, to ensure the fries don’t brown too quickly before becoming crisp. He even ran back to the kitchen to show me a cold leftover fry salvaged from each batch to illustrate his point. I’ll have to give him the benefit of the doubt. I was perfectly pleased with the poutine (which featured more of the limp fries) and the basic burger which had tons of fresh beefy flavour and nice char on the exterior. The bun (sesame seed studded, squishy soft, and white) and the special sauce (his mother-in-law’s “secret” recipe with ketchup, mustard, and sautéed onions among its ingredients) gave it a certain, shall we say, recognizable quality. I happen to like the thinner burger patty; only ¼ lb of beef, unlike many gourmet burger places that have bumped a standard burger up to 1/3 lb. 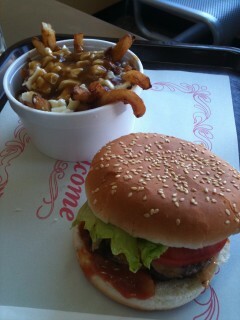 In the end, it was like eating the ultimate quarter pounder and the quintessential roadside casse-croute poutine. Whether or not the fries fully live up to the legend remains to be seen. Mille et Une Frites, 58 rue Eddy, Gatineau (Hull sector), 819-205-1095. Hours: Winter (mid-November to mid-May) Monday to Friday, 11 a.m. to 4 p.m.; Summer (mid-May to mid-November) Monday to Friday, 11 a.m. to 7 p.m.